Tulsa Roughnecks FC was in need of a positive result Thursday night at ONEOK Field and it came in the form of a big 4-1 win over the Orange County Blues. The Roughnecks got another goal from local product Cristian Mata and an impressive performance in goal from Jake Feener in his USL debut to help record the victory. The win improved Tulsa’s point total to 18 and its record to 5-8-3. With the loss, the Blues saw their record fall to 7-8-1 with 22 points. For the first 15 minutes, it did not appear that three points were likely for the Roughnecks. The Blues started positively, and it took a pair of big saves from Feener in the 11th minute to keep the match scoreless. The Roughnecks started to settle into the match midway through the half. Brady Ballew and Oscar Jimenez had shots turned away by Blues’ keeper Pepe Miranda. Tulsa finally broke through to open the scoring in the 30th minute when local product Cristian Mata settled a cross from Iarfhlaith Davoren and placed a low shot into the corner of Miranda’s net. It was the second goal in three matches for the Tulsa resident. Cristian Mata photo courtesy of Rich Crimi. 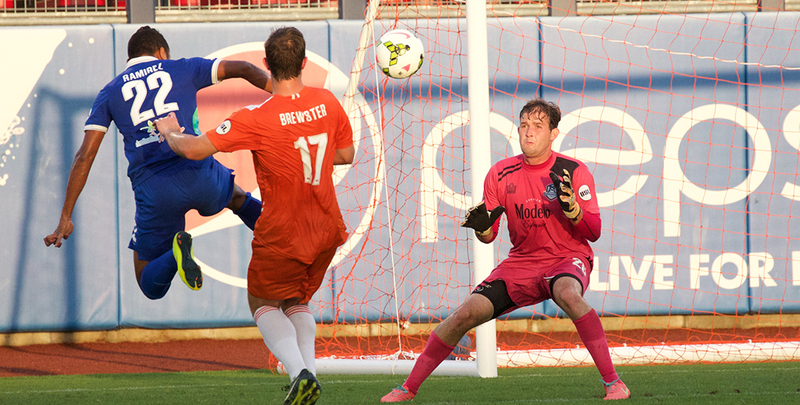 The Blues evened the score line just before half when they caught the Roughnecks’ defense out of position. Didier Crettenand’s shot left Feener with no chance and tied the game at 1-1 as the team’s headed to the halftime locker rooms. After the interval, the Roughnecks caught one of the few breaks they have received this season. In the 48th minute, a cross from Steven Miller was directed into Miranda’s net by Blues defender Jack McCracken for an own goal to put Tulsa in front to stay. Jimenez made it 3-1 in the 58th minute. Oscar blasted home from close range on a cross from Ballew for his first-ever USL goal. Down two goals, the Blues press forward in an attempt to get back in the game, but Feener was up to the task. Kyrian Kidd put the game out of reach when he tapped home a free kick cross from Chad Bond in the 90th minute. It was Kidd’s second goal of the year and gave the Roughnecks a 4-1 victory. Feener was outstanding, registering 13 saves in the match as the Blues outshot Tulsa 24-16. The keeper was awarded the Joe Momma’s Man of the Match by the Roustabouts for his performance. The Roughnecks will get little time to enjoy the result. They will be back in action Saturday night at ONEOK Field as they host top of the table Colorado Springs. Kickoff is scheduled for 7:30pm.